Put 4 to 5 pumps of oil into the palm of your hand. Spread between your palms and then apply to your face. Start with your cheeks, then your nose, mouth and jawline and finally the area around your eyes. Splash your face with warm water and continue to massage the oil into your face and eyelashes. Now here’s the absolutely crucial part. Take a clean flannel. Soak it in hand-hot water, wring it out, and put it over your face. Breathe in and allow the steam to penetrate your pores. Then, gently wipe everything away. Repeat if necessary. To finish, splash your face with warm water and pat dry with a clean towel. 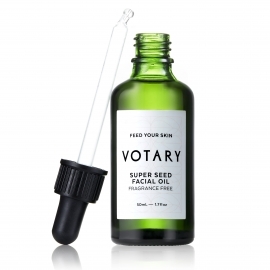 Follow with Lemon and Neroli Toning Serum and Super Seed Facial Oil. 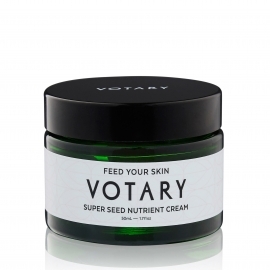 For the full Super Seed experience, hydrate your skin from the inside out with our Super Seed Nutritional Supplement. 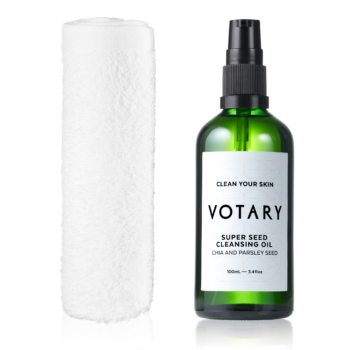 The Votary Super Seed Cleansing Oil comes with a free 100% cotton face cloth. The best way to beautifully clean skin. 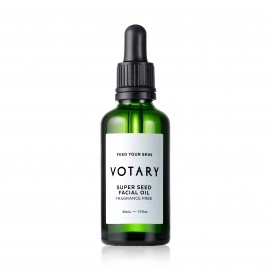 At Votary we couldn’t love face cloths more. 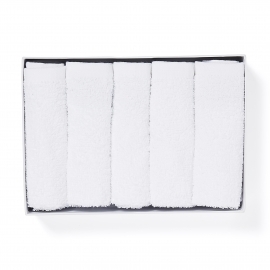 Every one of our beautiful cleansers comes with a white, soft, cotton face cloth to help you clean your face properly. 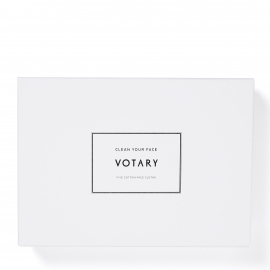 Face cloths are a crucial part of the Votary 3 step routine. They’re brilliant multi-taskers. When wrung out in hand-hot water and applied to your skin, they bring steam and warmth. 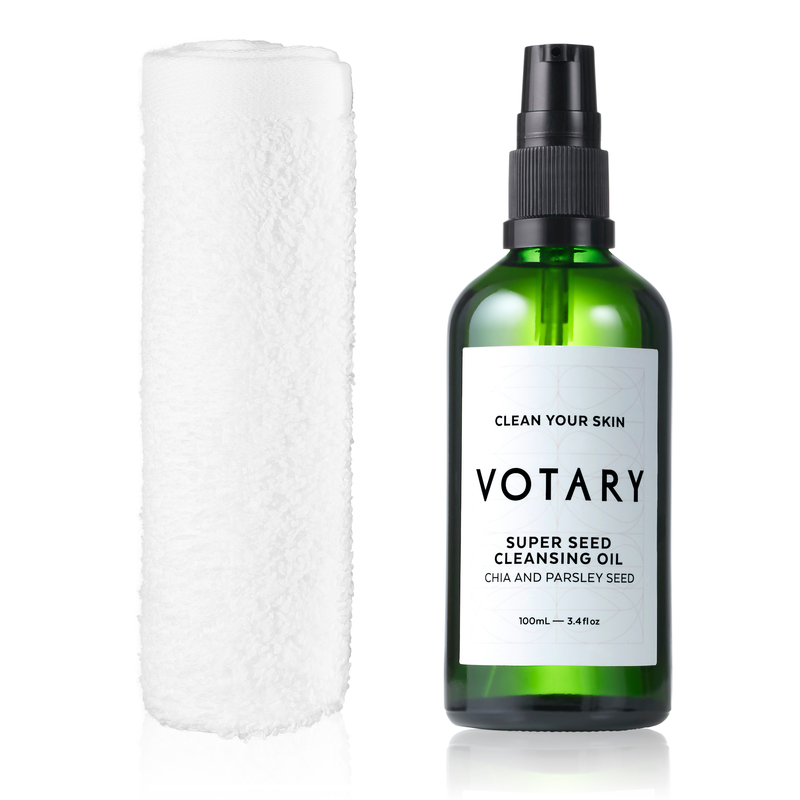 This helps your skin to relax and release, and maximises the Votary cleanser’s natural power. The soothing aromatherapy moment – when you breathe in the gorgeous fragrance – also helps to settle your mind. When you begin to wipe your face, the face cloth helps to lift away every scrap of grime, make-up and SPF. The gentle action also means any dead skin cells are carefully exfoliated away, leaving you with beautifully clean, plumped and hydrated skin and a healthy glow. 100% cotton. Wash at 60C and tumble dry. Made in Portugal.